Branch Arts curates and produces exhibitions and installations for museums, galleries, charities and corporate clients. With long-standing working relationships with some of the best exhibition technicians and creatives around, we manage projects on every scale, ranging from installing an art collection in a client’s home to an exhibition in a listed building. Often with a wide network of collaborators we have collectively conceived and realised large-scale festivals, exhibitions and performances. Flora Fairbairn has been curating exhibitions across the globe for over 15 years. As a pioneer of the 'pop-up' exhibition, she has also specialised in producing exhibitions in newly discovered, unconventional gallery spaces. Throughout her career, Flora has collaborated with 100s of artists, designers, architects and developers, transforming a wide range of architecturally interesting non-gallery buildings into temporary exhibition spaces. Flora has also been invited to curate exhibitions in galleries and museums and for art foundations in the UK, Europe, USA and Cuba. Showcasing 25 of London’s finest MA and BA students, collated by Flora Fairbairn, Kay Saatchi and Catriona Warren. Hosted by the David Roberts Art Foundation. 14 artists from around the globe, exploring themes of ephemeral art. Co-curated with Olivier Varenne, many of the artworks in La Casa Encendida were site-specific. A unique installation of 90 RACE chairs, individually transformed by leading artists, architects, designers and fashion icons to raise funds and awareness for charity The Art Room. The central exhibition of several, as part of the art and music festival Concrete and Glass, a unique event showcasing innovative talent in both music and contemporary art. Greta Alfaro, the first beneficiary of the Genesis Foundation Scholarship programme at the Royal College of Art. Solo exhibition in the Fish & Coal Building, Kings Cross. An immersive, 6-screen solo exhibition of new high-speed films exploring issues of religion and social struggle between Catholics and Protestants in Scotland. A group exhibition providing a platform for emerging Cuban artists, hosted by Havana Club’s Havana Cultura Programme, at the 11th Havana Biennial. 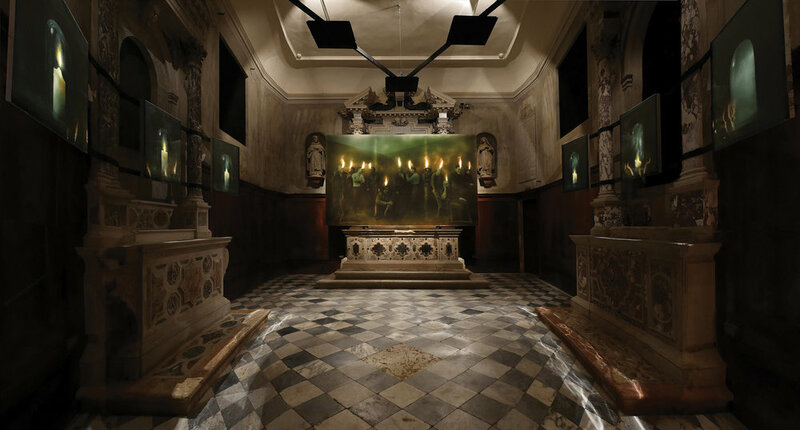 Paul Benney’s Speaking in Tongues and Reliquary series was presented during the 2017 Venice Biennale - alongside a holophonic sound installation - at the Church of San Gallo. Inaugural exhibition of new works by then recent Royal College of Art graduate Rachel Kneebone, to launch Madder Rose Gallery in Clerkenwell, London. A group exhibition of 50 UK based artists, showcasing new and innovative approaches to the medium. Co-curated with Sotiris Kyriacou in collaboration with Bill Burlington. A group exhibition focusing on the use of Old Master iconography in contemporary art, emblematic of a return to painting and drawing on the part of young artists. In collaboration with Seth Stein Architects, a contemporary house in Notting Hill, designed by the firm, was transformed into an innovative and evolving exhibition space curated by Philly Adams and Flora Fairbairn. A solo exhibition for Anna Boggon that showcased works made between 1994 - 2004 that addressed the nature of perception and its cultural and psychological duality. A site-specific group show of 17 artists in a disused Victorian warehouse in St John St, Clerkenwell, as part of London Architecture Biennale and Art Fortnight London.